There’s nothing like a good salad. Sometimes that means an abundance of crunchy veggies, and other times that means hard boiled eggs and bacon and cheese and a really bad-for-you dressing – proving that a “salad” can really be anything you want – over some lettuce and drizzled with some vinaigrette. This healthful salad has it all – a little crunch, a little cheese and with sweet potatoes and quinoa – it’s quite filling! Preheat the oven to 450 degrees and line a baking sheet with foil. Toss the onion and sweet potato segments with 2 T of olive oil and a good sprinkling of salt and pepper. Roast in the hot oven until the onion begins to caramelize and the sweet potato is tender – this could take about 30 minutes depending on the size of your sweet potatoes. Prepare the quinoa according to package instructions and set aside. In a dry pan toast pine nuts until they become fragrant. Toss together with the quinoa and season that with salt and pepper. If you have the time, make the above items ahead of time so they can come to room temperature by the time you assemble the salad – but if they’re still warm that’s nice too! Prepare the dressing – let the minced garlic, a good pinch of salt and the vinegar sit in the mixing bowl for a few minutes before adding the olive oil. Whisk to incorporate the oil as you stream it in, taste and season the dressing with pepper and possibly a touch more salt. 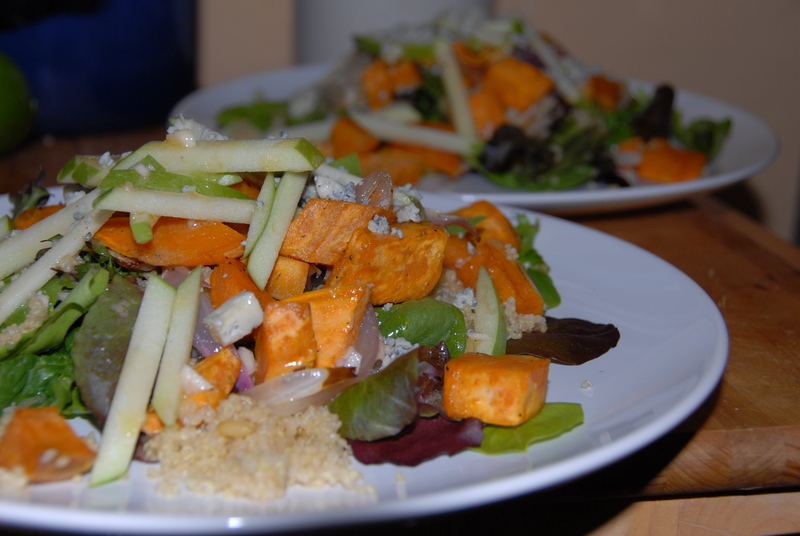 Thinly slice the apple last and then assemble – lightly dress the lettuce with a little vinaigrette, layer on top of the greens the quinoa & pinenuts, sweet potatoes & onion, fresh cut apple slices and the Gorgonzola cheese. Top it all with a bit more vinaigrette. This concoction makes a deliciously hearty salad and it makes plenty to enjoy the next day for lunch! This entry was posted in Apples, Healthy, Salad, Sweet Potato and tagged apple, gorgonzola, healthy, onion, quinoa, salad, salad for dinner, sweet potato. Bookmark the permalink.